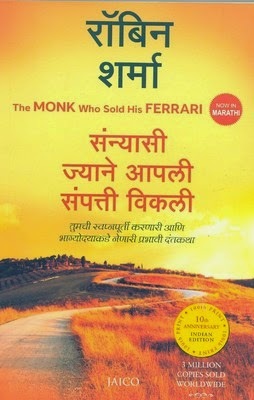 The Monk Who Sold His Ferrari (Marathi) is the Marathi translation of the bestselling English book on creating a life of purpose, passion, and peace. The Monk Who Sold His Ferrari (Marathi) is a translation of the powerful English fable that taught people how to live more fulfilling lives. It’s a book that guides people towards living a life of compassion, and encourages people to seek inner happiness. The wisdom contained in this book is expressed through a story of one highly successful lawyer, Julian Mantle. The book opens with Julian collapsing down to the floor in a courtroom as he suffers from a heart attack. This collapse is attributed to Julian’s strong inclination towards work and an inability to spend time on other fruitful activities. After this massive fall, Julian discovers that he is in a crisis. He has let things slip away and not given adequate time to, among other things, himself. With this realization, he decides to set off on a journey to the East. His spends years in the majestic mountains of the Himalayas and learns what was earlier missing in his life. He meets spiritual masters who guide him on his journey to attaining wisdom. Several years later, he returns. He meets with a lawyer, who is creating the life that Julian discovers he was earlier living. Julian knows from experience that this path is one of unfulfillment. He then shares his story and the things he discovered and learnt while he was living in the mountains. The Monk Who Sold His Ferrari (Marathi) is a book that teaches its readers to discover and follow their calling. It reminds readers of what it feels like to be a child and experience the joy of limitless possibilities. At the heart of the book, though, lies the fact that every second of our life needs to be lived more fully, and that we should be grateful for what we have now, while we build our futures. Although Robin weaves the wisdom of the East into a powerful story, he clearly presents the core principles and virtues by which to live. He provides guidelines such as live with discipline, embrace the present, practice kaizen, follow your purpose, and master your mind. He also asks his readers to form new habits such as reflecting on their lives for 10 minutes each day and look at how they can improve the coming day, convert negative thoughts into positive, and find the positive in every circumstance. Robin Sharma is a leadership expert, author, motivational speaker, and lawyer. The other books he has written are Who Will Cry When You Die: Life Lessons from the Monk Who Sold His Ferrari, Discover Your Destiny with the Monk Who Sold His Ferrari, and The Leader Who Had No Title. Robin graduated from the Dalhousie University School of Law with an L.L.B. He worked as a judicial law clerk at the Supreme Court of Nova Scotia and as a staff litigation attorney with the Canadian government. He founded a business training firm in Toronto, called Sharma Leadership International Inc. He was slotted 7th on the list of International Leadership Professional Gurus, and has received Toastmasters International’s Golden Gavel award.